It can be challenging for a lot of people to get back on track after the holidays, but it doesn’t have to be. Here are a few tips to help you get started for 2015! How do you get motivated? Ask yourself what motivates you? Why do you want to lose weight? Is it for your children so you can live longer to see them grow up, is it to look and feel better or is it a combination of things? Know why you want to lose weight and use it as motivation. Write those motivators down and look at them frequently to remind yourself why you are doing what you are doing. Boost your motivation by promising yourself a non-food reward when you reach your goals. Get support from others working towards the same goals, but remember, each person is different and it’s okay if your plan is different than someone else. Not having a plan is one of the top reasons for not having motivation or success, so create a plan that will work for you. When you are setting goals, be realistic and specific. Example: Instead of saying “I’m going to eat more vegetables…” you could say, “I’m going to eat a serving of vegetables every day this week”. Most people start off the year in full swing with grand, sweeping changes. Unfortunately for most, these changes will never stick. Start out small and build yourself up. Example: Instead of saying “I’m going to exercise every day” you could say, “I’m going to start exercising for 20 minutes two days a week”. You must break the “all or nothing” mentality. Just remember that “Slow and Steady Wins the Race”. After the holidays, everyone always feels so guilty for enjoying themselves. STOP! That won’t help with anything. You didn’t fall off the wagon; you just hit a speed bump, so move forward and know that tomorrow is a new day. When you are making healthy behavioral changes, know that failure is part of the process. Don’t give up if you experience setbacks or failures, be patient. Being healthy and fit doesn’t take perfection; so don’t be so hard on yourself. Always remember the 80/20 rule- 80% of the time make healthy choices, 20% of the time, enjoy yourself and indulge every once in awhile. http://www.nutritiontulsa.com/wp-content/uploads/2017/04/nct-logo.png 0 0 Laurenp http://www.nutritiontulsa.com/wp-content/uploads/2017/04/nct-logo.png Laurenp2015-01-09 14:45:322015-01-09 14:45:32Hello 2015, Good-bye Extra Holiday Pounds! It’s that time of year again. It becomes dark earlier, it is cold outside, and all we want to do is curl up next to the fire and snack on our favorite treats. We crave everything from sweets to salty and savory foods. Since it’s the holidays and we are generally wearing more layers of clothing, we tend to give into those cravings more than usual. Giving into some cravings over the holidays is perfectly fine and normal, but what happens when it gets out of control? The holidays come and go and all we are left with is wonderful memories, maybe a few cool gifts, and an extra ten pounds! Suggestions, not commands: Look at cravings as suggestions to eat and not as commands to overindulge. When you feel a craving, decide how you want to deal with it. You do not have to overeat. You may decide to wait a while and see if the craving passes. Substitutions: Believe that cravings will pass. Cravings are not hunger. They usually will go away if you distract yourself with other thoughts and activities. Exercise: Most people slack off around the holidays, but this is the time to crank up the exercise. Exercise provides the energy for those long hours of holiday shopping and it helps to alleviate stress, which can lead to fewer cravings. 1. Don’t skip meals. This backfires because you come to the next meal really hungry and eat more than intended. 2. Fill up on lower calorie, nutrient dense foods such as fruits, veggies, popcorn, and lean cold cuts on whole grain bread. 4. Use a plate for even the smallest snack—you’ll eat less. 5. Eat slowly and enjoy each mouthful. Hold your glass in the hand that you normally eat with to make finger foods less accessible. 6. Eat only when you are hungry and not because food is near or because everyone is eating. 7. Don’t waste calories on foods you don’t like or foods you can have anytime. 8. Contrast flavors, textures and temperatures for more satisfaction in your eating. 9. Don’t buy candy or goodies too far ahead of event. Once purchased, keep out of sight. 10. Avoid grazing while you cook. Little nibbles can really add up! When it’s time to eat, sit down and savor it! 11. Beware of liquid calories- eggnog, beer, soda, and wine. They go down so easy and often do not add much nutrition to your intake. 12. Become mindful while eating and pay attention to your fullness during a meal. Learn to stop at comfortable, not full. 13. Don’t hang out near the food- socialize a distance away. This will help prevent unconscious nibbling. 14. Write a list of things to do other than to eat (such as take a walk, call a friend or do some cleaning) to have available when you feel bored, angry, frustrated, lonely, depressed or any way that leads to cravings. 15. Be realistic: trying to lose weight during the holidays may be a self-defeating goal. Instead strive to maintain your weight. 16. When you arrive at a party, avoid rushing to the food. Greet people you know- conversation is calorie-free! Get a beverage and settle into the festivities before eating. Overall, you may eat less. 17. Ask for sparkling water (calorie free) with a lemon or lime twist rather than wine, champagne, or a mixed drink. 18. If you’re bringing a dish to share, make it healthful and delicious. That way you know there will be one thing you can munch on without racking up calories too fast! 19. Forget the all-or-nothing mindset. Depriving yourself of special holiday foods or feeling guilty when you do enjoy them, isn’t a healthful eating strategy. And deprivation and guilt certainly are not part of the holiday spirit! Lights, Camera, Action! And overeating? Most of us already know that watching television is associated with higher food consumption and a sedentary lifestyle. This is sometimes called mindless eating or paired eating, which is eating while doing another activity, such as watching television. More research is showing that the type of movie and TV show we are watching may influence the amount of food we consume as well. According to a study from Cornell University, action shows could lead individuals to eat twice as much as when watching other types of programs. During the study, participants were given cookies, candy, carrots and grapes for snacks and they were told to watch an action movie, a talk show, or the same action movie without the sound. The results showed that those watching the action movie ate 98 percent more than those watching the talk show, which was 354 calories compared to 215 calories. Those that watched the action movie without sound ate 36 percent more than the talk show viewers. The idea behind the study is the action movies are more engaging which leads to more food consumption without knowing it. Does this mean we should refrain from watching our favorite action movies? Absolutely not! However, it does mean that we should be more aware of our snack choices during a movie and pay attention to how much we are actually consuming. It is always a good idea to buy smaller portions, so you don’t end up scraping at the bottom of a large popcorn container wondering who ate all your popcorn. http://www.nutritiontulsa.com/wp-content/uploads/2017/04/nct-logo.png 0 0 Laurenp http://www.nutritiontulsa.com/wp-content/uploads/2017/04/nct-logo.png Laurenp2014-11-14 14:43:582014-11-14 14:43:58Lights, Camera, Action! And overeating? Is soy really bad for you? Or should we all be eating more of it? Unfortunately, if you read anything on the Internet, you might confuse yourself even more. That’s because some studies suggest soy might be linked to breast cancer, may destroy your thyroid, strip your masculinity, block vitamin and mineral absorption and may negatively affect your cognition. Whoa! If that’s the case, then we should all stay away from soy. However, most of the studies were poorly conducted and interpreted out of proportion to what the study was capable of showing. Soy and breast cancer: One of the studies done on mice that showed a link between soy intake and breast cancer did not take into account that mice metabolize soy isoflavones very differently than humans. Therefore, using mice would not be a suitable model for what happens in people. Some studies have shown the opposite linking soy to a decrease in breast cancer. Bottom line: Most experts agree that soy does not seem to increase or decrease the risk of breast cancer and is safe for consumption. Soy and your thyroid: Soy foods do not cause harm to your thyroid for most people. Studies have shown that soy has no impact on thyroid function in healthy people. However, some soy foods may increase hypothyroidism in those with subclinical hypothyroidism. Soy and masculinity: There is no real evidence to show that the plant estrogens in soy interfere with reproductive hormones in men. Studies show testosterone levels do not decline, estrogen remains within normal limits, and fertility does not decline in those consuming soy. However, soy may improve menopausal symptoms, specifically hot flashes in women. Soy and vitamins/minerals: Raw soybeans contain phytic acid, which can interfere with the absorption of iron and zinc. However, soaking, fermenting, cooking, and other processing methods reduce phytic acid levels. Studies show no change in iron or zinc absorption from those consuming soy vs. other proteins, such as chicken, beef, or dairy. 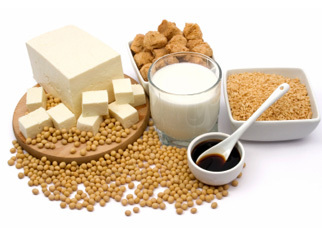 Soy and your brain: One study done at the University of Hawaii in 2000 showed men that consumed two or more servings of tofu a week were at greater risk of cognitive decline and brain atrophy than those that did not. However, since this study, more research was done and showed no difference in cognitive function among individuals that consumed soy vs. dairy. Dutch scientists found no difference using similar tests as well. Overall, soy is safe for consumption and may have a few health benefits as well, such as lowering cholesterol and reducing the risk of colon cancer when eaten in place of red meat. http://www.nutritiontulsa.com/wp-content/uploads/2017/04/nct-logo.png 0 0 Laurenp http://www.nutritiontulsa.com/wp-content/uploads/2017/04/nct-logo.png Laurenp2014-11-07 14:53:162014-11-07 14:53:16The Great Soy Debate! Where are Kids Getting Their Empty Calories? In the Journal of the Academy of Nutrition and Dietetics, a study compared children’s empty calorie consumption from three different sources, retail food stores, schools, and fast food restaurants. It also identified food groups that were top contributors of empty calories from each location and it determined the location providing the majority of calories for these main food groups. The study used data from 3,077 US children aged two to eighteen years participating in the National Health and Nutrition Examination Survey from 2009-2010. The results showed no significant difference for the empty calorie content of children’s intake from stores (33%), schools (32%), and fast food restaurants (35%). The food groups that were top contributors were similar from all three locations: sugar-sweetened beverages, grain desserts, and high fat milk (whole and 2%) from stores; high fat milk, grain desserts, and pizza from schools; and sugar-sweetened beverages, dairy desserts, french fries, and pizza from fast food restaurants. These findings warrant the need for improved efforts to reduce empty calorie intake among US children not only from fast food restaurants, but stores and schools as well. Until there is a change in school nutrition standards, schools will continue to serve food that resembles fast food restaurants. http://www.nutritiontulsa.com/wp-content/uploads/2017/04/nct-logo.png 0 0 Laurenp http://www.nutritiontulsa.com/wp-content/uploads/2017/04/nct-logo.png Laurenp2014-10-24 15:23:352014-10-24 15:23:35Where are Kids Getting Their Empty Calories? A common theme that has been plaguing America is our love/hate relationship with carbohydrates. We treat them like a disease, avoiding them at all cost, yet we yearn for them and even dream about eating carbohydrates. Let’s say we put a stop to the madness! Carbohydrates are NOT bad! Carbohydrates provide our bodies with energy, help control our blood glucose and insulin metabolism; promote fermentation and elimination in our gut, which aides in normal digestion and growth of friendly bacteria. Our problem is not carbohydrates, it is the amount we eat and the type we choose. The typical American diet consists of large amounts of refined grains such as sugary beverages, white bread, baked items (cookies, cakes, pizza dough), and many snack foods. Studies have found that these particular types of carbohydrates are linked to an increased risk of type 2 diabetes, heart disease, and weight gain. Diets high in minimally processed carbohydrates, such as whole grains, vegetables, fruits, and legumes are linked with a lower risk due to an increased amount of nutrients including vitamins, minerals, fiber and protein. Putting it all together. Carbohydrates are not the enemy as long as we choose wisely. Instead of grabbing a bag of potato chips, go for a baked potato topped with low fat cottage cheese or an apple with peanut butter. Work on including more fruits and vegetables with every meal and snack and make half of your grain servings whole grain (100% whole wheat bread, pasta or tortillas, brown rice, quinoa.) When making your plate, only a fourth of the plate should contain a starch and half should include fruits and vegetables, while the other fourth is filled with lean protein. Watch out for added sugar in things like cereal, yogurt, and oatmeal; sugar sweetened beverages, canned fruit, and juice. Bottom line; don’t be fooled by all of the fad diets claiming carbohydrates are bad and should be eliminated. Feed yourself appropriately, which includes healthy carbohydrates and your body will thank you for it. A common remark we all have heard is “eat your vegetables”, but most Americans still don’t consume even close to the recommended amount. We know veggies are good for us, but why is it so hard to get them in? We might think to add them in with lunch and dinner, but what about breakfast? Starting your first meal of the day with those vital nutrients from vegetables can be an ideal opportunity to improve your health and start the morning off right. Research indicates breakfast consumption can lead to a lower risk of chronic diseases, better weight management and improved mental performance. However, studies show it’s not just any breakfast that provides these benefits, but those packed with nutritious, high fiber foods, including whole grains, nuts, seeds, fruits and vegetables. Vegetable consumption has been linked to lowering the risk of cancer, heart disease, diabetes, Alzheimer’s and other diseases of aging. With that being said, why not start the day with veggies? Most Americans don’t think of vegetables first thing in the morning because it is not a common practice in the United States. However, many other countries around the world start their first meal with vegetables included. Keep in mind, that some of these countries have lower levels of chronic diseases than we do in the U.S., which may be a result of the eating habits in these cultures. Now you ask, how do I get veggies in for breakfast? The answer is, anyway you want! Try having non-breakfast items for breakfast, such as a baked potato topped with broccoli and low fat cheese or carrots and dried cranberries mixed into warm quinoa. Other options include vegetables added to omelets, smoothies or sandwiches. At the bottom is a list of delicious options that include vegetables with a variety of different breakfasts. Veggie Sandwich- you can add veggies to your breakfast sandwich or create a non-breakfast sandwich with either cheese or hummus and vegetables, such as cucumbers, tomatoes and roasted eggplant. Currently, 70% of women over the age of 50 are taking calcium supplements to improve bone strength. Unfortunately, calcium supplements have been linked to an increase risk for heart attacks. Not to mention, our bodies only absorb 500 mg or less at a time, even though supplements are usually at least 1,000 mg or more. If you are like millions of Americans, chances are you take omega-3 or fish oil supplements for heart and brain health. But the most recent research indicates you may not get these amazing health benefits from supplementation. Even worse, omega-3 supplementation may increase men’s risk for prostate cancer. This is the same for vitamin E. Supplemental vitamin E may not provide the same health benefits as eating foods rich in vitamin E and it too, may increase the risk of prostate cancer. So how can you best benefit from these health-boosting, disease-fighting nutrients? Eat your food, rather than taking supplements alone. Keep in mind, supplements were never meant to be food substitutes, but an addition to your already healthy diet. We know now that nutrients don’t work alone and to reap the benefits we need the whole food, rather than extracted nutrients in pill form. For example, broccoli contains phytochemicals called isothiocyanates, which are linked to a decreased incidence of tumors. However, without the enzyme found in whole broccoli sprouts, your body only absorbs a fraction of the amount, therefore eating broccoli is way more beneficial and that’s not even including the benefits from the added fiber. The latest research also indicates that many nutrients, plant chemicals and even fiber join together to bring more health benefits than taking them alone. Some studies show tomatoes help prevent cancer development, but when you pair them with broccoli, you can reduce your cancer risk even more. Bottom line…work on loading up your plate with high nutrient containing foods, rather than stocking up your medicine cabinet with supplements. http://www.nutritiontulsa.com/wp-content/uploads/2017/04/nct-logo.png 0 0 Laurenp http://www.nutritiontulsa.com/wp-content/uploads/2017/04/nct-logo.png Laurenp2014-08-13 15:13:102014-08-13 15:13:10Supplements...Friend or Foe?